I feel like this week is my week of giving you practical thangs to eat (see: Monday and Wednesday)! 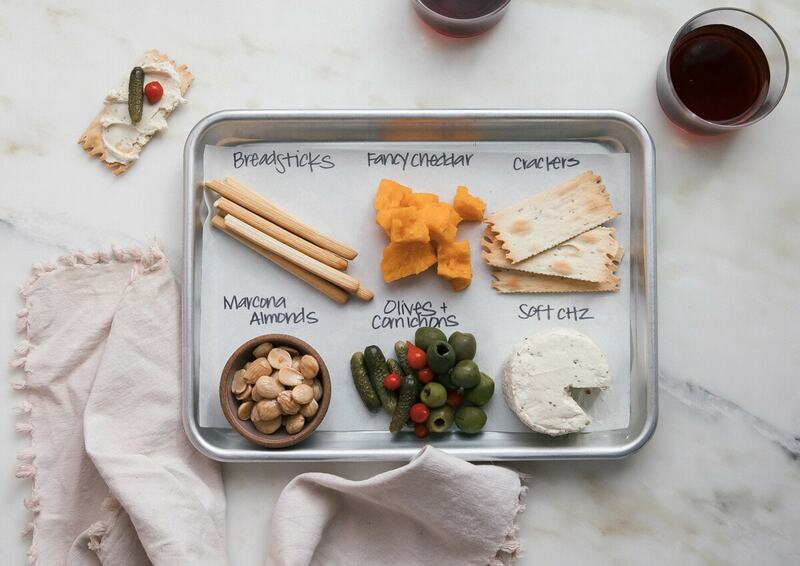 I love gawking at those crazy cheese boards all over Instagram but realistically most of us won’t make one of those. Or maybe we will but it’ll be for a big party or around the holidays when we have twenty people over. But sometimes I want to eat a cheese plate for dinner but it’s just Josh and me. Or maybe it’s just for a girlfriend/dude friend and me. Or just me and my mom. I could eat appetizers for dinner and do all the time (especially when Josh is working late or out with his friends and I’m on my own). Seriously, me wanting to eat an appetizer for dinner is Josh’s worst nightmare. Nothing makes him give me a gigantic eyeroll more than when I tell him, “I’m not really that hungry, I kinda just wanna snack.” NO. He is a meal person. I understand. Most of the time I am too but sometimes I just wanna eat this! For him, this type of situation constitutes as pre-gaming. Ok, so the main objective when I go to the store for something like this is to NOT spend a million dollars. 1. Two cheeses. I like to pick two cheeses that are complementary but opposites. One soft cheese and one hard cheese. For this plate, I went with a an awesome Irish cheddar (for an affordable/delicious option, I love Kerry Gold cheddar—so good!). 2. Nuts. 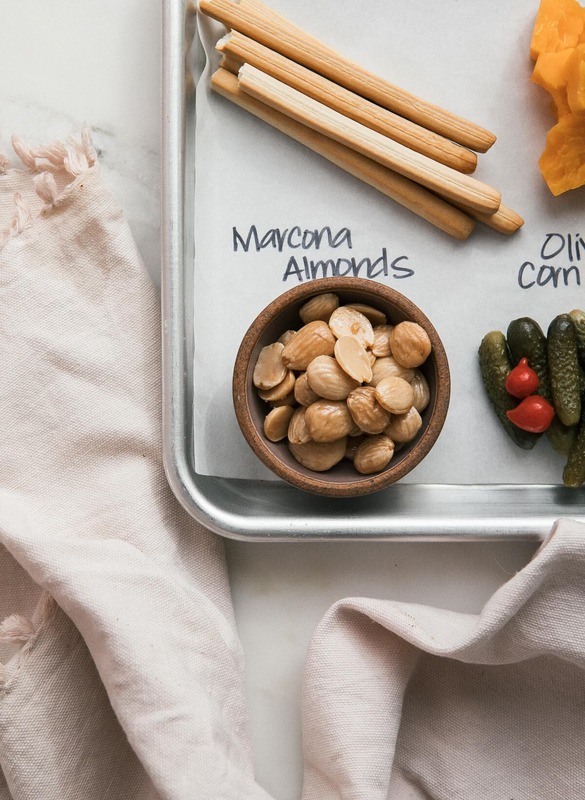 You only need really one kinda nut snack situation. 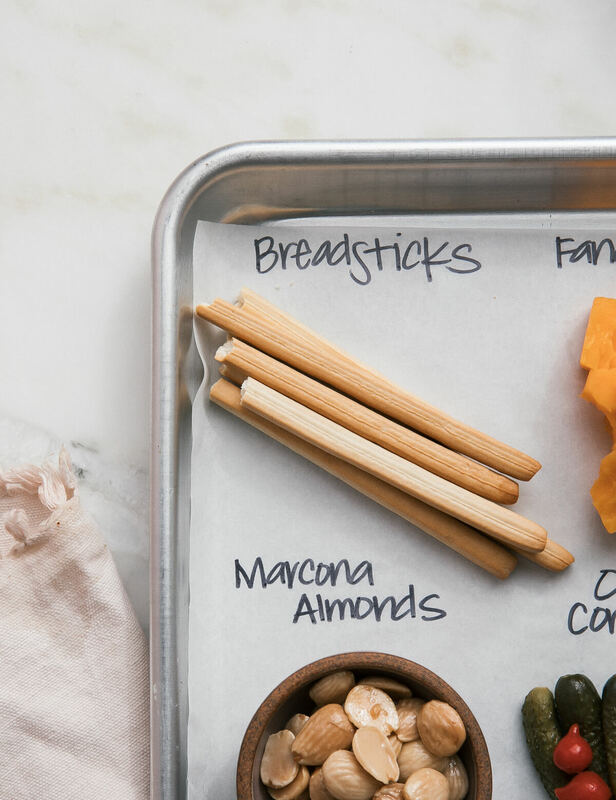 My favorite are macrona almonds. They’re Spanish and fancy and delicious. The bulk-bin is perfect for the right amount of nuts. 3. Carbs. You need a vehicle for that cheese. On this particular day I had grissini/breadsticks so I included those. 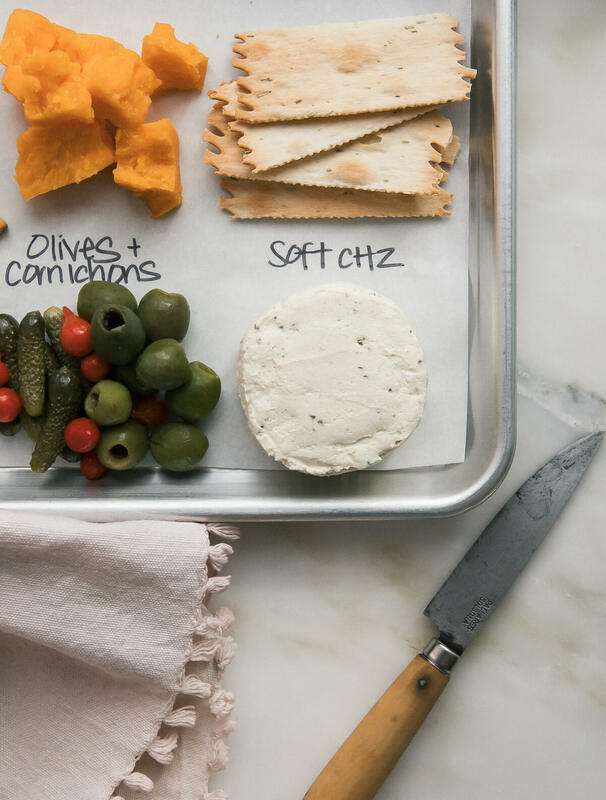 But these rosemary salted crackers were also a great option. I think one cracker and one bread item is good. 4. Something pickled. Or sweet. Or both. I went pickled on this particular day so that meant corichons, olives and sweet drop peppers (they’re SO GOOD!). 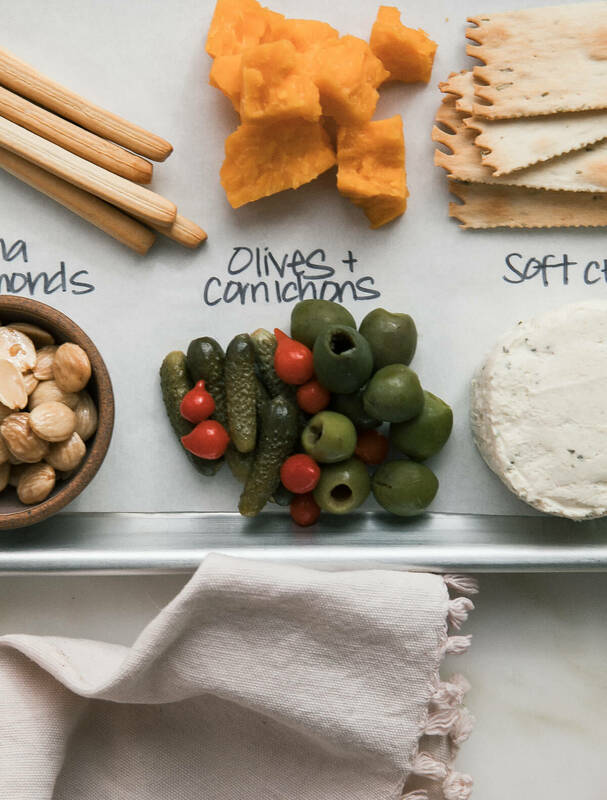 The olive bar at a grocery store is your best bet because you can buy exactly the amount that you want/need. Some sweet options would be dried apricot, honey, dried cranberries, fresh fruit (apricots, pears, etc.) and/or jams. Oh and wine! Or beer. Or iced tea. 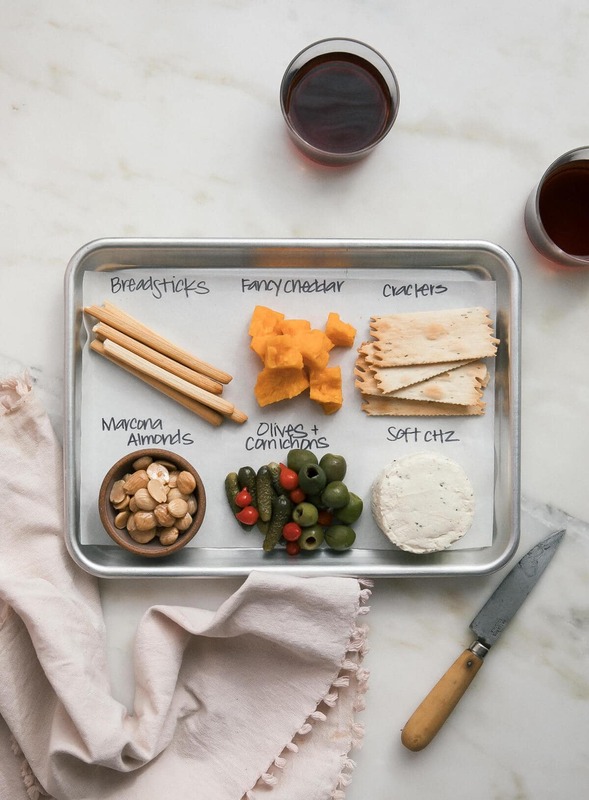 Put it on a pretty cutting board or you can do it like I did: take a piece of parchment, label your favorite cheese plate items and place them right next to the labels. Okay, I LOVE this post!! 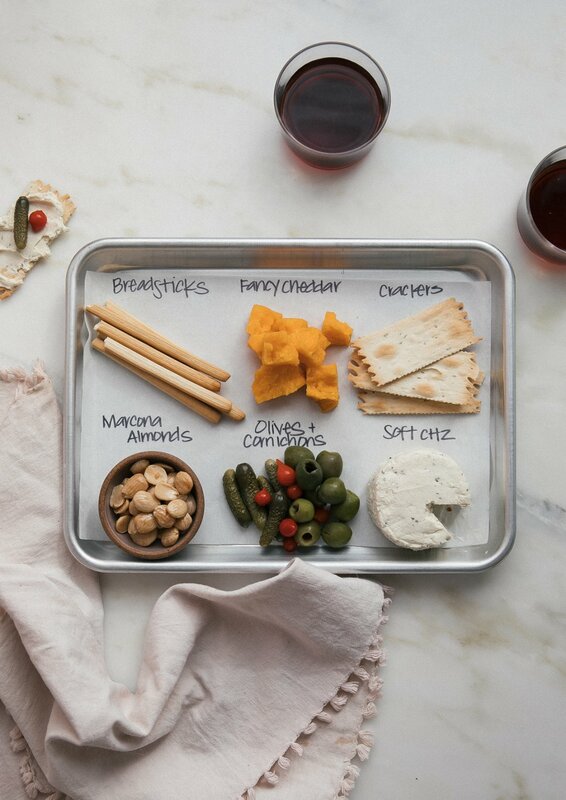 I always find it so challenging to make the cheese platter look full, but not overspend on 6 different cheeses. I always think it looks too sparse and end up throwing strange things on there just to fill the space. 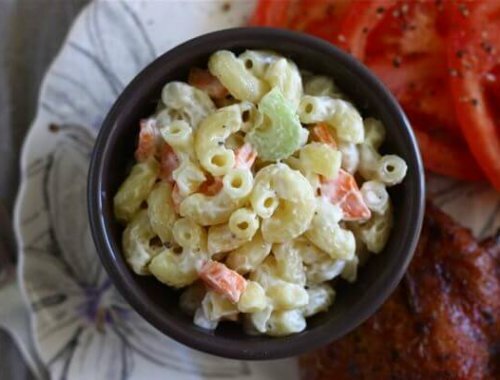 I like the idea of smaller quantities of different textures and food items. Simple but stellar for this lovely Friday! Thanks as always for posting! This is a regular Friday night dinner for me only it doesn’t get plated so well. When I do have guests, I use a smallish chunky bamboo cutting board and pile it high. It looks weighty even though I haven’t really spent too much on stuff to go on it. A recent fave to add it a hot option. Warmed goats cheese (just so it’s soft) topped with a drizzle of honey and sprinkle of dukkah. Adorable, and great tips, another great choice is a shropshire which pairs perfectly with port! 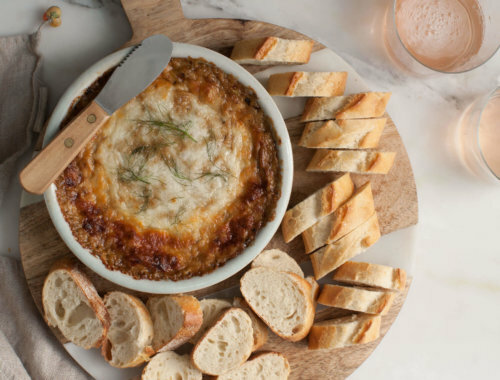 Talk about eating appetizers for dinners. My wife and I do this frequently. We joke that the easiest way to determine the caliber of a restaurant is a quick glance at the appetizer menu. Is it sliders, potato halves and spinach dip or beets, goat cheese, emulsions and satay? We’ve actually opened the menu, took a look then sneaked out. The best cheese board I ever had was on Oceania cruise (incredible cuisine). It has four rare cheeses with very unusual sides. I ate it at the restaurant and enjoyed it. I tried many times but failed. Today saw your guide I learned a lot and drawn many useful things. I believe this time I will succeed. Thanks a lot! LOVE these suggestions! 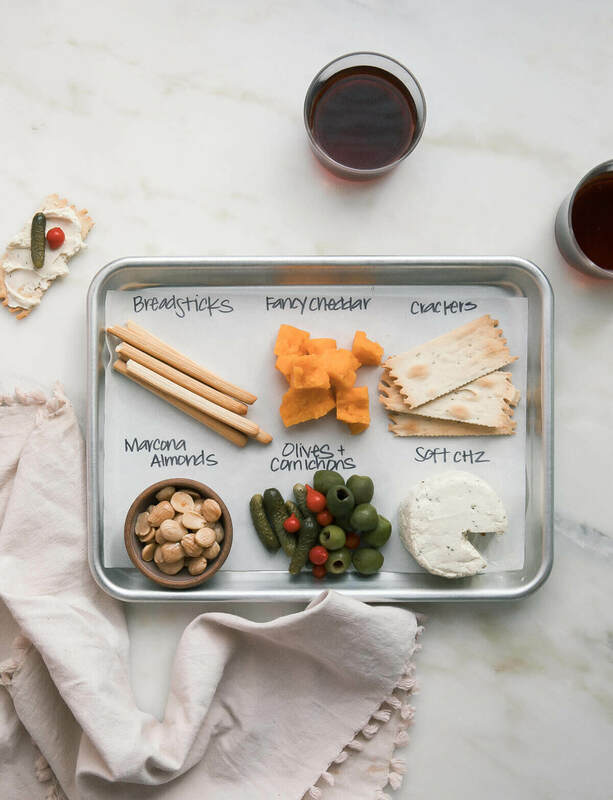 Want to do a cheese plate for two Thanksgiving. THANK YOU! Amazing suggestions! VEry useful and helpful thanks for sharing.